Belgian architect Paul Robbrecht of Robbrecht en Daem recalls the slightly unheimlich positioning of Victor Horta’s 1928 Palais des Beaux-Arts in Brussels. Its characterful, blocky, Art Deco stone facade runs down the curved and steeply sloping Rue Ravensteinstraat, linking the Royal Palace and civic complex at the top of the hill with Horta’s Centraal station and the gothic/baroque city centre at the bottom. It is a liminal zone, connecting busy urban spaces but itself unpopulated. Robbrecht remembers three shops there as somewhat motley and fly-by-night – particularly a charming down-at-heel classical record shop from his youth – a memory that drove the firm’s design for the new Café Victor Bozar. Robbrecht wanted to arrest that prevailing sense of transience; to freeze the music, to make people stop and stay. With the long-vacant shops knocked into one, the firm had 740m2 of space to intervene in. ‘Our initial inspiration was Horta’s original brass window frames, a material that we decided to take inside the café and work with,’ says Robbrecht. ‘We also wanted to make vague connections with the materiality of the museum and concert hall, like the original green linoleum tiles in the foyers, and reinterpret them here.’ These influences are combined with more esoteric concerns. When asked about the circle theme that abounds, he talks of the outward-facing, international nature of the cultural institution; a global touchpoint, ‘though we wouldn’t want to make that obvious’. But it unavoidably is, whatever he says. The firm’s circular bespoke brass chandeliers, bulbs pointing in all directions, unify the three spaces as it steps down the hill. Those same circles become vertical brass circular bands that wrap huge mirrors separating the runs of thick, green leather banquette seating from each other. The same diameter of hole is cut through loadbearing walls, some tantalisingly showing artist Valerie Mannaerts’ enormous handmade curtain, which can be drawn to divide the space. You also sense some real hearkening back to the proto-modernism of turn of the century Vienna in the solidity and quality of the materials chosen. Robbrecht en Daem chose a pale green, fine grain terrazzo to line and top the long cocktail bar. It appears again lining the walls near the kitchen as a robust dado again, and as a circular inset in the poured, dark screed of the floor. 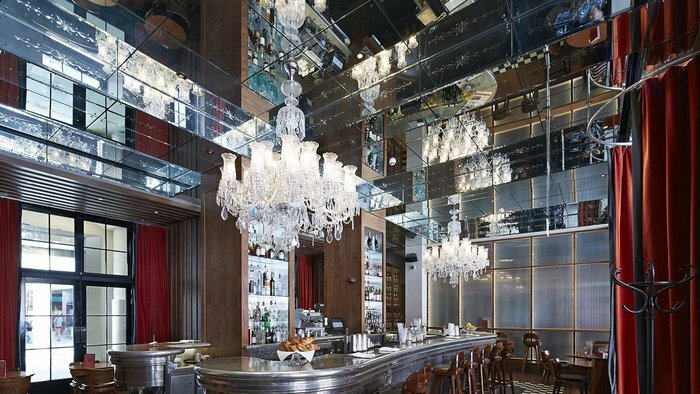 Fixtures and fittings have the same imprimatur of quality and longevity; brass and glass sparkles in the light with the bespoke shelves built behind the bar while the inlaid, stained walnut of the tables is echoed in the deep interior window reveals. The palette is simple, but it is all rich, highly crafted and curated. Opened late last year, and costing more than double the initial budget to build, Robbrecht admits that the cost hadn’t been topmost in their mind. More was the feeling that the café should be there for the duration, to reverse the fleeting fortunes of this in-between place in the city. ‘We hope that Bozar will become an important place for generations of artists, musicians and culture lovers to meet,’ he concludes, while admitting a vested interest: ‘We actually built it for ourselves for when we are very old.’ But that’s architects for you; they know the cost of nothing and the value of everything.